It is easy to romanticize about the beauty and functionality of vintage hand tools, but on a day-to-day basis there are some unsung heroes put to work on my bench that deserve mention. 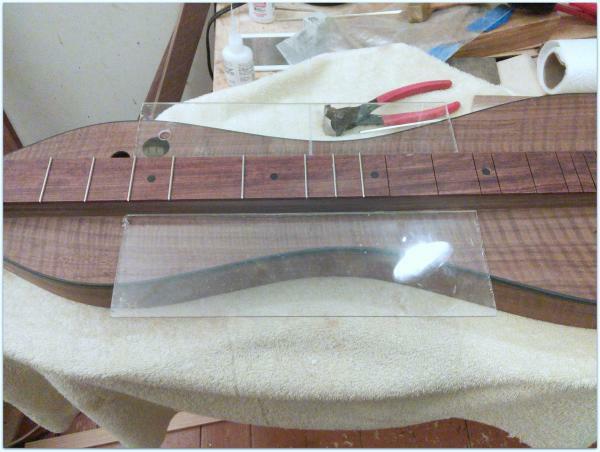 In this photograph two plexiglass rectangles protect a dulcimer soundboard during fretting. Years ago I used cardboard for this job. Then one fine day an errant piece of grit found its way under the cardboard and scratched the top of a dulcimer. Next time I used a piece of plexiglass to protect the top so I could see what was going on underneath. Another problem solved by modern science! One of the plexiglass rectangles has a line scribed across the center of the width. I use this to layout braces on the back of a dulcimer. The scribed line goes over the center line on a dulcimer back and makes a simple task of placing braces square to the line if so desired. I also use these rectangular marvels as see-through and somewhat flexible clamping cauls. Very ingenius, indeed! I have a related question….you place the frets on a nearly completed dulcimer by tapping them in place….how do you do so without damaging the dulcimer, even if you tap them with light pressure? I’d be afraid to do that job (but I know you are the expert and are used to it)! I put the frets in midway through finishing because the wood has had a lot of time to adjust to becoming a dulcimer! I can make any adjustments if need be and be sure the fretboard is right late in the game this way. Fretting a completed dulcimer is like fretting the fingerboard extension on a guitar over the soundboard. I can’t just whack it with a hammer! What I usually do is file the tangs of the frets a little thinner so the frets don’t need too much aggression to go in and use adhesive to make sure they are tight, solid and snug. More work, more fun! I learned something new today, thanks Doug! Very interesting.